Following on from the previous post, my friend Ian Paul (Dean of Studies at St John’s College, Nottingham, where I trained) informs me that in modern Greek, kairos now means season, or weather. I find that really interesting. Yesterday I was having a conversation with another friend, in America (Skype is a good thing). We were discussing fruitfulness. Jesus says, by their fruit you shall know them – that is to say, the condition of our hearts is revealed through something observable; something that can be bitter – such as envy – or sweet – such as generosity. Clearly, we would hope to bear good fruit, the external outworking of an internal transformation. But even so, fruit is produced in its season. The consumer can get fruit instantly, at any time of year, simply by going to the supermarket. The farmer knows that fruit has a season – and that attending to the fruitless times is essential if the crop is to be a fruitful one. In John 15, Jesus describes the process of achieving fruitfulness: the gardener prunes back the branch; the branch is surrounded by the thickening vine-stock; the branch grows out from the vine; the branch bears fruit; the branch is pruned again, and the cycle repeated. In order that our lives are fruitful, the Father prunes back our lives, inviting us into times of retreat, of intimacy with Jesus. The pattern of discipleship is one of invitation and challenge. Both, held in tension, are necessary: but in pruning and abiding, invitation is the leading beat to our rhythm of life; in growing and bearing fruit, challenge is the leading beat. Is it coincidence that, living in societies where the supermarket has flattened-out seasonality, that we expect to be fruitful all of the time? Is it coincidence that we have overlooked the need for pruning and abiding? The meaning of words evolves over time. I’d suggest that the meaning does not change arbitrarily, but as different expressions of the potential meaning contained within the word – just as every seed produces a plant that is true to its type. A kairos, therefore, is (amongst other things) a shift in season: from fruiting to pruning to abiding to growing. 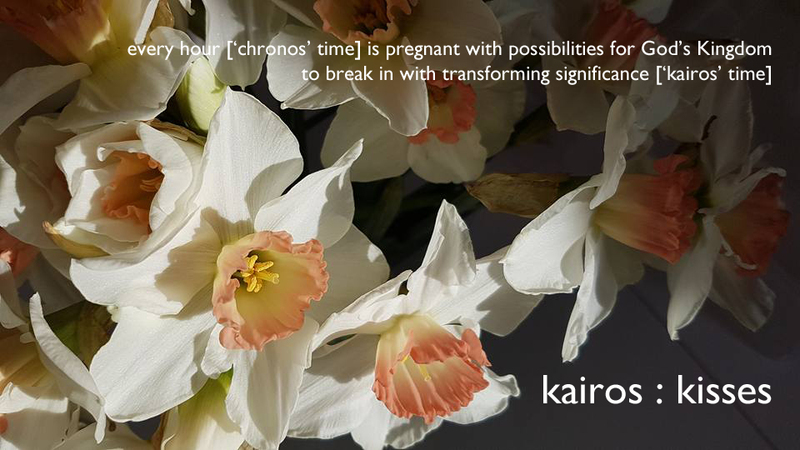 A kairos expresses God’s current activity within chronos. A kairos is a change in the weather: rain and sun (God’s blessing on the righteous and the unrighteous alike), again often connected with seasons. In Greek, there is both chronos – sequential, process, time with length – and kairos – consequential, event, time with depth. In Greek mythology, Chronos was the Titan, father of the Olympian gods, who devoured his own children until betrayed by his wife and defeated by his son Zeus. A tyrant. The other evening Jo and I were with Mark Carey and a number of other friends who meet together once a month as part of our commitment to one another within The Order of Mission. At some point in the evening, Mark mentioned the tyranny of time – that is, what happens when we misunderstand time with the result that it shifts from being a light yoke to being a heavy burden. As part of professional or community development, we have become familiar with being asked to make plans – 6-month plans, 12-month plans, 2-year plans, 5-year plans – setting goals we will be measured against in order to be held accountable. And it is often said that most people over-estimate what they can do in one year, and under-estimate what they can do in five. There is nothing wrong with making plans, or indeed with setting goals. The problem comes when chronos, rather than kairos, becomes the driver, becomes the yardstick against which accountability is measured. We become so focused on delivering our agenda – or meeting someone else’s – that we become deaf and blind to God’s timing. We set our course, and fail to notice when God says, turn here. It is much easier to measure what we do within chronos time than it is to measure how often we have responded rightly to kairos times, because this is what we are used to measuring, have grown competent at measuring. We need to unlearn how we measure time, in order that we might grow in competency at recognising and responding to kairos events. There comes a kairos when Jesus sets his course towards Jerusalem and sets out on a journey through chronos towards his goal. But that chronological passage is punctuated by kairos moments Jesus responds to. In so doing, rather than trying to force circumstances, he makes himself available – whether by exercising agency, as when he opens the eyes of blind beggars on the road outside Jericho; or by surrendering agency, as when he allows the Father to hand him over in the Garden of Gethsemane – for heaven to break into earth through him, at the Father’s prompting. Another way might be to set measureable goals as part of our plan in response to a kairos (to repent involves observation, reflection, and discussion; to believe involves forming a plan, being accountable, and acting in a new way), rather than as a To Have Done By This Date List; taking them seriously but holding them lightly, open to the disruption of other kairos moments (every kairos changes our world, and some more dramatically so than others). Jesus sends his disciples ahead of him with the instruction to look out for the ‘person of peace’ (Luke 10). Contrary to popular belief, this is not an evangelistic strategy. It is a strategy for disciples who would make disciples who would be capable of making such disciples in turn. These are not the same thing. For many, the working definition of a person of peace is someone who isn’t a Christian but is open to you, and therefore open to being introduced to Jesus by you. But this doesn’t equate to what Jesus does in sending his disciples to those who were already within the ‘house’ of Israel, who already worshipped God and knew something we ought not dismiss about not only knowing about God – as God-fearing Gentiles did – but knowing God. For our context, a person of peace is someone who is open to you, specifically to you as a disciple, whether or not they already worship God as revealed in Jesus. The church community I am currently a part of is composed of two neighbouring Anglican congregations, ‘inherited’ in their patterns and concerns, within which I have an oversight responsibility. Within that (kind of) community there are (always going to be) a few people who are opposed to me, whether because they were especially close to my predecessor, or because I don’t fulfil their expectations and am unwilling to fulfil their demands, or because of a personality clash, or for whatever reason. Do I need to love them? Yes. I need to love them and pray for them, forgive them and bless them. But I ought not to focus my time and energy on them. If I do, I will end up railing against something – whether in hate or love – rather than making disciples. Then, there will be others (most likely, the majority) who are indifferent to me, perhaps because they know that I am only passing-through and they will be here (out of commitment to place, or out of apathy) when I have gone. Do I need to love them? Sure! I need to nurture them in whatever way I am able. But I ought not to focus my time and energy on them. Indeed, this is a major tyranny of the inherited church belief-system, that as a member of the clergy I am there to be equally available to all. I call it a tyranny because this belief, so different from Jesus’ practice, has borne fruit of worn-out overseers and diminishing members of the Body of Christ. As a strategy, it fundamentally works against making disciples. But Jesus sends us with instruction to seek out the person of peace. Someone who is open to us, who will welcome us, who will look for ways to bless us, to support us – the person of peace is God’s relational provision in any given context. This is the relationship that I need to focus on – and in so doing, other open-to-me relationships will be opened up, for the person of peace is the door-keeper into community. A person of peace is not someone who looks just like me, who shares my interests. A person of peace is not a yes-man, not someone who will become a clone, like me but lacking my original spark, or any original spark of their own. The person of peace is, rightly, a demonstration of unity in diversity. And while we are all called to live in harmony, the person of peace is a vital ingredient in the recipe for that to be worked out in practice. There is, potentially, a person of peace in every ‘village’ I go to, every little community: in my church; among the staff at the local convenience store, the local cafes; at the sports club. Potentially; but not necessarily – in which case, after genuine searching proves fruitless, move on again (frequent another social space). Some of them know Jesus already. Some of those haven’t previously thought in terms of following him, or even considered the possibility; others have, but haven’t really known how to go about that. Some of them don’t know Jesus yet. Does it matter? I don’t think so. That is, I want to see people follow Jesus, want to help them follow Jesus; but my person of peace is a person of peace wherever they are in relation to Jesus, because it has to do with what Jesus, by his Spirit, is up to in their life regardless. If I want to build a team, I look for the person of peace. If I don’t find one, that is one way of discerning that the task or the timing might be mine but not God’s. Likewise, if I enter into a new context, I look for the person of peace; and I will prioritise being with that person over being with other people, because by being with that person I am placing myself in the centre of what God wants me to do. And there, I watch and listen, for opportunity to introduce earth to heaven. Jesus is the revelation of God: when we look at Jesus, we see God represented without any distortion. Moreover, Jesus’ revelation is consistent with the two great themes that give structure to the story revealed in Scripture (that is to say, the living Word is consistent with the written Word), Covenant relationship and Kingdom responsibility. Jesus taught that God is our Father, who provides what we need, and protects us (not least from ourselves); and King of the Universe, who passes judgement on our debts with justice and mercy held in perfect balance, and delivers us from his enemies. But Jesus also lived out these truths. The Gospel reading for this coming Sunday is Mark 5:21-43, the account of the healing of a woman who had suffered continual menstrual bleeding for twelve years (and as such was considered permanently ‘unclean,’ was permanently excluded from her family and wider community) and of the restoring to life of a twelve-year-old girl who had died (note: this is not a resurrection – the girl was not given an imperishable body and would have gone on to die at some point in the future; but it is the restoring of life that had been taken away by death). In this account, I would suggest, we see can see Jesus as the revelation of God as Father and as King, in relation to both the woman and the girl. Jesus addresses both the woman – ‘Daughter’ v34 – and the girl – ‘Little girl’ v41 – in relational terms and with familial tenderness, driving out fear with love. Jesus provides for the woman in the broadest and deepest sense, by restoring her to her community; and ensures that the little girl is given something to eat, v43. Jesus sends the healed woman out to ‘Go in peace’ v34, to be led on the path of wholeness, to experience the guidance of God’s peace that keeps us within his will, that lifts from us to alert us when we are straying. And he protects the little girl from become the centre of the attention of the crowd – a celebrity freak – by giving strict orders not to let anyone know what had happened, v43. That Jesus reveals the kingship of God is seen both in the crowds who gather to see him pass by wherever he went, v21, and in the way he exercises authority over them, issuing orders that are to be obeyed, vv37-39. That Jesus represents without distortion God’s kingly role as judge is seen in Jairus (the little girl’s father) falling at his feet and pleading with him, and Jesus going with him, vv22-4; and in the woman, likewise, falling at Jesus’ feet, trembling with fear, and Jesus responding with compassion, vv32-34. We plead and tremble before one who judges us, who exercises power over us; and discover that our debts – here, debt includes the inability to pay for the healing sought – are not held against us. Jesus delivers the woman from suffering, v34, and the girl from death, v42 – both of which oppose God’s will and neither of which will have any place in God’s future when his kingdom is fully come. Unlike Jesus, we cannot reveal and represent God without any distortion; and yet, we are called to reveal God as faithfully as we can and represent him as fully as we are able. Like Jesus, we are called to embody Covenant relationship and Kingdom responsibility, to live in and to live-out their implications and consequences. Yesterday I posted on the Lord’s Prayer, through which Jesus reveals to us that God is our Father, who provides and protects, and also the King, who cancels our debts and delivers us from his enemies. Today I want to take a look at Isaiah 40:1-11 (one of the Lectionary readings for this coming Sunday). The context is this: God’s people are living in exile in Babylon; speaking through his prophet, God tells them that after judgement comes restoration, that they are to prepare to return home, and that the Babylonian empire (along with all other human empires) will not last, whereas God’s promises do. Isaiah 40: 1 Comfort, comfort my people, says your God. 2 Speak tenderly to Jerusalem, and proclaim to her that her hard service has been completed, that her sin has been paid for, that she has received from the Lord’s hand double for all her sins. 3 A voice of one calling: ‘In the desert prepare the way for the Lord; make straight in the wilderness a highway for our God. 4 Every valley shall be raised up, every mountain and hill made low; the rough ground shall become level, the rugged places a plain. 5 And the glory of the Lord will be revealed, and all people together will see it. For the mouth of the Lord has spoken.’ 6 A voice says, ‘Cry out.’ And I said, ‘What shall I cry?’ ‘All people are like grass and all their glory is like the flowers of the field. 7 The grass withers and the flowers fall, because the breath of the Lord blows on them. Surely the people are grass. 8 The grass withers and the flowers fall, but the word of our God stands forever.’ 9 You who bring good news to Zion, go up on a high mountain. You who bring good news to Jerusalem, lift up your voice with a shout, lift it up, do not be afraid; say to the towns of Judah, ‘Here is your God!’ 10 See, the Sovereign Lord comes with power, and his arm rules for him. See, his reward is with him, and his recompense accompanies him. 11 He tends his flock like a shepherd: he gathers the lambs in his arms and carries them close to his heart; he gently leads those that have young. How, then, do we live in exile, as God’s people in a post-Christian society? We live knowing that God is our Daddy, who comforts us (v1) and relates to us with tenderness (v2). We live knowing that God comes with his reward and his recompense (v10), his abundant provision. We live knowing that God gathers us in his arms, carries us close to his heart, and leads us (v11). We live knowing that God is revealed in glory (v5), coming with Sovereign power to exercise rule (v10). We live knowing that God has paid our debts, has decreed an end to our debtor’s prison sentence (v2). We live knowing that these verses as a whole proclaim God’s kingly will to bring his people out of captivity and bring them home. These words are spoken to a people living in an alien culture, spoken in order to renew their hope, spoken to give birth to faith (Romans 10:17) – which is the concrete expression of hope (Hebrews 11:1), the transformation of potential future into actual present (just as cement mix can become one of many things – a path, a building block, a sculpture – but set concrete is a particular and lasting form). These words are written down and handed on, in order that they might do the same for us. We spent the weekend at the (six-yearly) global gathering of The Order of Mission. If the New Wine National Leaders Conference a couple of weeks back was an opportunity to get together with our closest friends, a gathering of TOM members is when we get together with our spiritual family. I am deeply thankful for both friends and family; though it is a bitter-sweet thing that both are so dispersed, and when we get together there is never enough time to spend with everyone. But it was a joy to be with brothers and sisters we have known for many years, and to meet other brothers and sisters for the first time. Among other things, our Senior Guardian Mike Breen helped us look together at the Lord’s Prayer, through two familiar lenses, as a tool for attending to our personal and communal lives. Here are my notes/reflections on Mike’s structure/connections. Lens 1: The two strands that run through Scripture: Covenant and Kingdom: relationship and responsibility, being and doing, identity and activity, coming to Jesus and being sent out by him. Lens 2: Jesus sums up how to live life well in this way: love God (UP, passionate spirituality), love one another within your household (IN, radical community), and love those beyond your household (OUT, missionary zeal). The pattern Jesus gave for prayer addresses these three dimensions of life (the flow is from UP to IN to OUT), each expressed in both Covenant and Kingdom terms (again, there is a flow: we need both covenant and kingdom, but responsibility flows from relationship, doing from being, activity from identity – not the other way around). God is our loving Father, who longs for intimate relationship with us as his children. He is not distant, absent, aloof, or abusive. We are children, not slaves. God is also King of the Universe. Never less than Daddy, but more than just Daddy: “our Dad has a very important job” and we need to recognise his kingship over our lives. Jesus reveals to us that God our Father wants to give us good gifts, that he is generous, that all he has (and he owns everything) he shares with us; we do not earn access to his provision. We tend to think of forgiveness as coming to our father, but Jesus describes it as needing to deal with the king, to whom we are in debt. The question is whether we are under the king’s judgement, or whether our debt has been cancelled. Jesus is clear that unless we show mercy and cancel the debts of our debtors, a just king cannot cancel our greater debt to him. One of the roles of fatherhood is to offer protection – sometimes by physical presence, and controlled aggression (having learnt mastery over our physicality); sometimes by establishing boundaries within which freedom can be enjoyed. As a personal example, on holiday recently I spent time climbing over rocks with my children, sometimes leading ahead of them to follow my example, sometimes telling them where it was not safe for them to venture. In this way, my children grow in confidence (especially the less adventurous) and wisdom (especially the more adventurous). One of the roles of kingship is to deliver your people when they are in danger of being taken captive, or have been taken captive – as will be the case from time to time, given that another role of kingship is to deploy ambassadors who will represent him in the world and soldiers who will stand firm against his enemy. As people (especially as people shaped by western society? ), we tend to be creatures of division and over-reaction and demarcate our lives in ‘either/or’ polarities, but living life well generally requires of us that we see life in terms of ‘both/and’ continuums, not polarities. Polarised categories tend to be our way of trying to create and maintain control over our lives; continuums – living with tension and paradox – bring us to the place of acknowledging our need for God, and allow the conditions needed for his creative new life to emerge. Passionate spirituality is nurtured in the paradox of experiencing God as both Father and King; refusing to settle for impersonal legalism on the one hand, and cheap grace on the other. Radical community is nurtured in the creative tension of experiencing the Father’s provision and the King’s cancellation of our debts; as we learn to be generous, and practice our responsibility to cancel debts. Missionary zeal is nurtured in the continuum of experiencing the Father’s protection and the King’s deliverance; giving us confidence to go out into the world, and the backing we need to be ambassadors of heaven and soldiers in the spiritual battles we are engaged in. As you create space to listen, what does the Spirit want to say to your spirit today? For anyone who was at the New Wine National Leaders Conference two weeks ago and heard Alan Hirsch so graciously honour me from the stage but didn’t know why, it was for my interpretation of Paul’s use of Psalm 68 in Ephesians 4:7-11. Psalm 68 is a multi-layered depiction of God descending from Mount Sinai and ascending Mount Zion; a victorious figure returning home with those taken prisoner by his enemies, whom he has set free; leading a procession of captives, who present him with their tribute; and distributing gifts, including the gift of relationships and the gift of spacious and secure territory to settle, to his people. As a result, God’s reign is extended over the nations, to his glory. Why does Paul make use of this Psalm in this context? My contention is that he is interpreting it as an image of Jesus’ incarnation and ascension, to explain how Jesus has set prisoners free, received them as tribute, and given them to his people, for the purpose of the expansion of his family and extension of his kingdom. Moreover, the implication of this is that everyone being an apostle, a prophet, an evangelist, a pastor or a teacher – the text makes it clear that these are all people-as-gift – is not something that we become at the point of liberation but something we are, that is liberated. In other words, being an apostle, prophet, evangelist, pastor or teacher is what Jesus created you as; and – as a result of his incarnation and ascension, following the triumph of his resurrection – when we recognise Jesus as King, when we offer ourselves to his service (kingdom), when we are set free to be his family (covenant), then he gives us to his body (covenant relationships and kingdom purpose; being and doing). Clearly there are those who pioneer beyond the known and reform the known, who pursue justice and creativity, who spread good news, who heal the broken, and who hand on wisdom to the next generation, who are yet to meet Jesus for who he is. from something that begins at conversion to something that begins way before that point. Making disciples is about helping others discover who God created them to be, to step into and live in the freedom God intended, and to engage with the – at times messy – dynamics of inter-dependence. It is well established that I am of the opinion that Ephesians 4:1-16 is key to the reimagining of our ecclesiology – what church is and does, both gathered and sent – that is needed as we move into a future of increased economic, political and social instability as the times God has called us to live in. Ephesians 4:1-6 is concerned with unity: one body, one Spirit, one hope, one Lord, one faith, one baptism, one God and Father of all who is over all and through all and in all. Ephesians 4:12-16 is concerned with maturity: with the community of faith growing, more and more, into what it would look like if Jesus was present in and through us...I know of no Christian tradition or denomination or indeed persons who would argue that these verses are anything other than enduring, of as much relevance to us today as to the believers to whom they were first written. The context to which I am sent is the Church of England. As a tradition, along with other traditions, we have made a number of moves. We have claimed that apostles and prophets are discontinued, serving a limited role in the birthing of the Church, not an ongoing role in her maturing. Their legacy is seen as contained in a body of writing handed-down and interpreted (controlled) by pastors and teachers, not the authentic reproducing of apostles and prophets. We have also reapplied the role of pastors and teachers as being oversight positions, whereas the text itself speaks of apostles, prophets, evangelists, pastors and teachers as encompassing everyone: it does not address oversight at all. These are paradigm shifts away from the insight of Paul’s reflection on the body of Christ. In practice, we have elevated a two-fold ministry model as our model of oversight, our criteria for selection and for job description. Moreover, my observation (and I think I have observed enough over many years to offer this insight) is that we view the local on-the-ground in-the-parish role as that of the pastor, and the trans-local role (the apostolic and prophetic roles?) as that of the teacher (conference speaker, author). So, I would suggest, the majority of our local church leaders are pastors. And pastors are people-people. That is, their particular and God-given focus is people. As opposed to apostles, whose focus is shaping environments; prophets, whose focus is God’s voice, and the gap between God’s intentions for human society and our present structures and experience (as such, prophets are often considered idealists rather than realists); and teachers, whose focus is God’s written Word. Pastors are focussed on people (and in particular their healing and nurturing)...and so are evangelists. Evangelists are people-people too: that is, their passion is gathering and distributing good news, not for the news’ sake but for the benefit that it might bring to people. As people-people, they most naturally look to that other people-person gift, the role of the evangelist (at any rate, apostles and prophets are ruled-out; and teaching has come to be seen as a technical role requiring years of training). They may even see pastor and evangelist as two sides of the same coin – an inward and outward expression – though if they do, they are wrong: you can be a pastor to Christians and non-Christians alike; and an evangelist – someone who brings good news – to non-Christians and Christians alike; pastors and evangelists are different people-focused people types, not the same type in different contexts. So they encourage – perhaps more with the stick than the carrot – the congregation to be evangelists (the PointFive in the TwoPointFive-Fold Ministry: what everyone who isn’t in oversight does to expand the community under oversight). Which is a great permission-giving release into who God has made them to be for any evangelists...and ill-fitting armour for everyone else. Just yesterday, I attended a meeting of representatives of the various Anglican churches in our town, where we were exhorted at length and with some passion that we needed to mobilise our congregations in evangelism – mission with no apostolic or prophetic strategy, no natural role for pastors or teachers. In my experience across several churches, evangelists are relatively rare but nonetheless extremely effective in bringing people into the orbit of the life of the church community. We do not need more evangelists – though at times and in places those who are not by fundamental nature evangelists may be called to do the work of an evangelist, and in so doing become more rounded in our Christlikeness (which is carried, in potential, in every Christian; but expressed most fully in community not isolation). We need to release evangelists to be evangelists, and apostles to be apostles, prophets to be prophets, pastors to be pastors and teachers to be teachers...in order that we might do those works which God prepared in advance for us to do, and that the body of Christ may be built up. One of the first things this does – not just in theory, I have seen this in practice – is release people from the burden of guilt of not being what they are not, into the liberating freedom of being who they were made to be. Then, of course, comes the work of learning how to live in inter-dependent freedom. This truncated and ill-conceived present understanding reveals the extent to which a reverse paradigm-shift in our imagination is required, if we are to recover the ways of being church that carries the potential to grow into maturity, defined not as head-knowledge of creeds and doctrinal statements but as the ongoing dynamic redemptive work of Jesus in his world. It has been a while since I posted last. Immediately following Pentecost, Jo and I had three days away at the New Wine National Leaders’ Conference in Harrogate, which was a real gift. Both keynote speakers are personal friends of ours, and among 1300 conference attendees both took time to hang out with us, a curry with one and a bottle of wine with the other. We attended the plenary sessions, but skipped the seminars, ducking back to our hotel to enjoy the steam room and hot tub. In addition, we got to catch up (and catch a coffee or a beer) with a long list of dear friends. Three days of rest and food for heart and mind and soul and body. Then last week we took off on family holiday, to a stunning beach in the far north west of Scotland – a first outing for our trailer tent – with Jo’s mum and dad, via two nights in Glasgow celebrating Jo’s birthday with my sister and her family, my brother over from Edinburgh, and my mum and dad. One of the things we were inspired by in Harrogate was the need to embody the Christian life, the need to shift from defining core values to defining core practices. (Core values are meaningless unless expressed through core practices; indeed, they are worse than meaningless, because they trap us.) Life is a matter of observable practices, that are achievable, measureable, manageable – and shared with others, that is, to which we can be held and hold one another accountable. Being a disciple isn’t something in addition to life – life takes up 100% of who we are; we have no more to give – but is a way of living; an integrated thing. And something accessible and flexible enough for the whole family to join in. So we have come up with our family framework for core practices: LOVE. L is for Learn, about Jesus. In creative and tailored ways. Stories from the Gospels. Reading other books. Observing creation and asking what it reveals to us about the nature of its creator. So on holiday we scrambled over what geologists believe are perhaps the oldest rocks on earth, and experienced the revelation that Jesus created them in the intention that one day a little boy would get so much pleasure from adventuring over them. We found a headland strewn with tiny yellow flowers, scattered like confetti, lasting perhaps only days and seen by hardly anyone, and discovered that Jesus is extravagant and free. O is for Offer. Ourselves. Our time. To others. In flexible but measureable – accountable – ways. Isn’t this how Jesus lived? Perhaps, as a minimum practice (the youngest member of our family is five), once a week within our immediate family, once a week within our church family, and once a week within our wider community. Not in addition to what we do but as part of what we do anyway because this is how we live. So, for example, I regularly go in to school to listen to children read once a week. I am not able to do that every week, but it is part of my rhythm, as much as I am able. For Jo, Offer may look like being proactive about hosting an after-school play-date for each of three children over the course of each month. E is for Enjoy. Enjoy life. When we look at Jesus, in the Gospels, we see someone who enjoyed life – yes, not every aspect, but nonetheless – who was the guest at many parties and the host on other occasions; who lived gratefully, with much gratitude for every good gift from heaven; and who came that those who responded to him might experience life in its fullness. Some Christians live as if they believe that life is not meant to be enjoyed, that to do so is somehow improper, whether because they believe that we are fundamentally sinners and therefore meant to live under judgement (whereas the life-in-all-fullness Jesus speaks of is, first and foremost, living post- God’s judgement) or because the spiritual warfare we are caught up in (Jesus contrasts his coming that we might have life with the thief who comes to steal and kill and destroy) is very real. But Jesus, who was more aware of that spiritual struggle than anyone, still chose to enjoy life. So Enjoy is one of our core practices. To enjoy the place God has sent us, as fully as possible. So, for example, we will go out for breakfast on a Saturday morning, to one of the local cafes, as a regular discipline; and Jo and I will go out for lunch, whether on my day off or on another day in the week, regularly. We will look to go out of an evening; and look to do so on a reciprocal babysitting arrangement so that another couple, ‘tied’ by young children, can also go out. We will holiday. Life is to be enjoyed. To LOVE is simple enough to live, and flexible enough to be lived in ever-changing ages and stages and contexts. To LOVE is simple enough to reproduce, so that others might express the same core practices, in ways that are unique and appropriate to their ages and stages and contexts, in just the same way as our children share our DNA and our features are discernible in theirs while they are nonetheless unique and beautiful people. To LOVE is simple and flexible and practical enough to be multiplied out across a community, as common core practices expressed at personal, nuclear and extended levels. And as common core practices, love covers – or makes up the lack in – a multitude of shortcomings.